The more you bring the tools you already use into Slack, the more powerful Slack becomes (kind of like Voltron). With more than 80 integrated services (and counting!) that’s a whole lot of power. But which tools should you integrate, and why? This is the start of our series on integrations with one of the quickest and most powerful options: integrating Twitter mentions into a Slack channel in just a few clicks. Many companies use Twitter as a one-way broadcast of corporate news, while your customers may prefer to get support or request features. In other words, they want have a conversation on social media. Using Slack to track every Twitter mention of your company’s @username is a good way to gain insight into how (and how often) customers talk to and about your company. It also means your team can talks about the best way to answer a tweet in your Slack channels before they “tag in” to answer publicly on Twitter. Twitter integration is a powerful tool for your company and the setup process takes just a couple of minutes to complete, which we’ll walk through below. 1. Go to Team Settings and choose Configure Integrations to launch the Team Site. 2. Select Twitter from the list of Integrations, then hit the Add Twitter Integration button on the resulting page. 3. Authenticate with Twitter. Next, fill in the Twitter username you’d like to track in Slack. 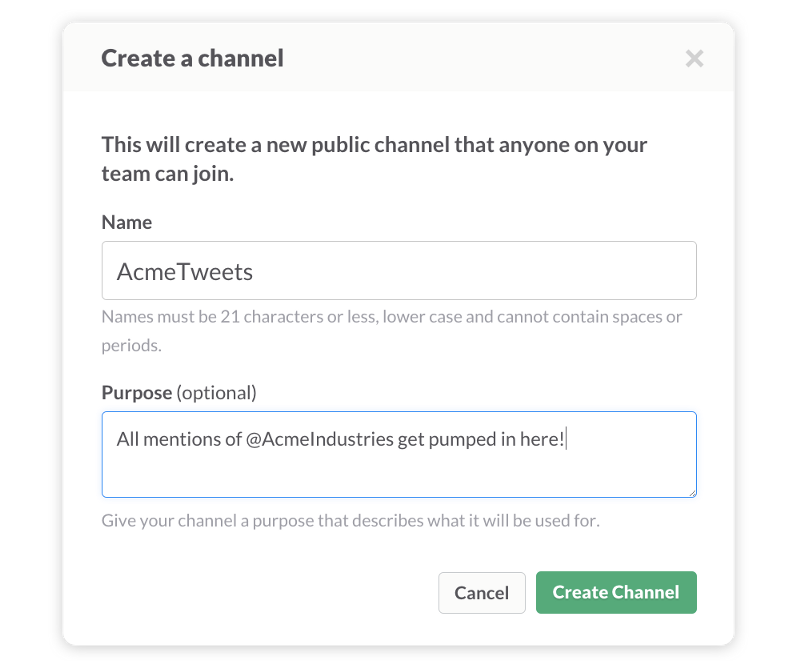 Select display options for which types of tweets you want to see in Slack (both of these steps are required to show output). 4. Select an existing channel (i.e., #support or #pr), or create a new channel dedicated to it. 5. Save your settings and you’re all done! You should soon see Twitter mentions flow, like a glorious 140-character river, into your previously designated Slack channel. With this tool, you won’t miss Twitter conversations about your company again. 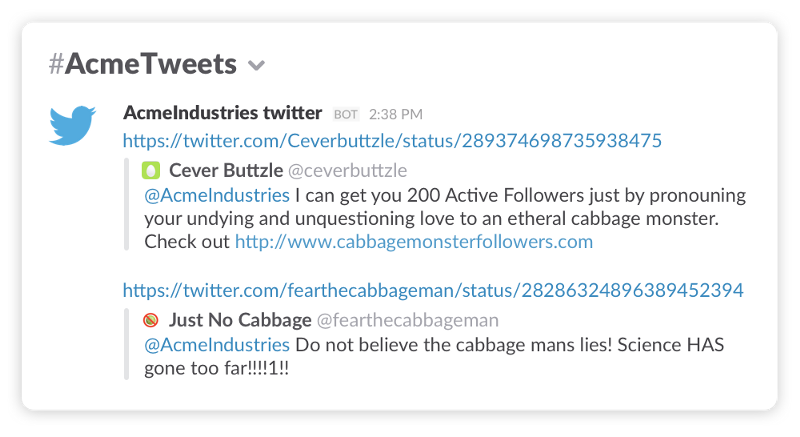 You’ll also gain the benefit of being able to search past Twitter mentions going forward, directly in Slack. Get updates from services you rely on: when they add a feature or have an outage, you’ll know, right in Slack! Follow accounts of similar businesses in a #friendly-competition channel to keep tabs on what your competitors are up to in real-time. Organize! Gather tweets from every company-owned account in one place, so everyone’s on board with what’s already been said. Get the latest tweeted local transit info into your local office channel, so people know when bridges or bus lines are closed before leaving work. Most integrations for Slack are just as easy to set up — a couple clicks and a small bit of information and you’ll have things like every code check in, every support ticket, and inline file display custom tailored for any channel. Slack is what you make it, go forth and bend it to your will.